Artists are always finding new ways of connecting with their communities, and what says community more than your Alderman's office. OpenWall is an initiative being executed in the 47th Ward office and by 47th Ward artists and Alderman Pawar. As a lifetime Chicagoan I realize the importance of the Ward office, if you have problems with the city and want them taken care of it, you can storm into the Ward office and yell "Who do I need to talk to to get (fill in with service you are looking for)" and that is how it work, or doesn't depending on the response you receive. This is an important fact because if most of the traffic you are attracting is angry or at the end of their rope it is important to not give the impression you, the Ward, is trying to hide behind politics and red tape. 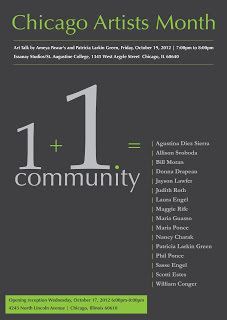 Alderman Pawar said it best while speaking to the artists and attendees at the opening of "1+1=Community", the current show up in the 47th Ward office, when he said "The art disarms people". Curator of OpenWall, Patricia Larkin Green, has a particular sense of what can be accomplished with this initiative, not only for the artists and the ward but for the arts and those who appreciate the arts throughout the city. I think this is a great step to get the arts attention in politics. We found out last night that these shows have influenced Alderman Pawar to buy art, and not just any art; he is buying local art which in turn supports his community and constituents. It is important that artists and politicians understand that working artists are a part of, not only a creative community, but of the business community. To be building a bridge that connects artists with local politics will keep arts in community discussions to beautify neighborhoods and build the business of a thriving arts community. It should also be noted that on Friday October 19th there will be an artist talk from 7pm -8pm at Essanay Studios/St. Augustine College 1345 West Argyle Street Chicago, IL 60640 .